Young Nepalis created a map of the Dead Sea with used plastic bags Wednesday in a bid to set a new international record and raise awareness about the vast volumes polluting the world’s oceans. 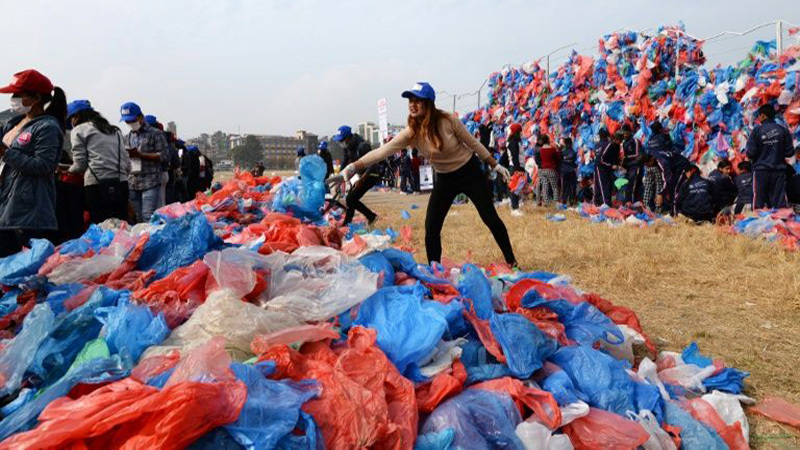 Volunteers tied 100,000 colourful used plastic bags on a metal grid 20 metres (65 feet) long and five metres (16 feet) tall, shaped like the Dead Sea, on open ground in Kathmandu’s city centre. The record attempt was organised with a slogan “One Dead Sea is enough for us”. Global plastic production has grown rapidly, and is currently more than 400 million tonnes per year. It is estimated that two to five percent of plastics wind up in the oceans, where much of it breaks down into tiny particles that harm marine life. Over 150 volunteers worked for months to collect and sort used plastic bags from schools and public areas. Among the participants was 20-year-old environment student Prakriti Pandey. “I had heard news that plastic was found inside a dead whale, so I felt I should join this initiative to spread awareness around the world and in my country,” she said. The current record for the world’s largest sculpture of plastic bags was set in April 2012 when over 200 Singaporean volunteers shaped 68,000 plastic bags in the shape of an octopus, according to Guinness World Records. The Nepalese group said it will now submit its claim with video evidence for a new record to Guinness.